To view a printable version of this Item Click here. Unlike a stamped DVD, DVD-Rs are manufactured with a spiral groove (like a phono disc) called the pregroove. It provides a precise track for the writing laser to follow. A DVD player depends on following the recorded track of pits in order to track the spiral path. A slight wobble in the pregroove in a pre-established pattern generates a frequency used as a carrier signal; the timing information helps regulate servo motors, tracking of the laser assembly, and focus of the beam. Land pre-pits molded into the substrate provide address information and pre-recorded data, used to initiate write operations. DVD-R recording requires a more complex write strategy to establish the appropriate lengths for the pits, which are approximately half the size of those on a CD-R disc. The spacing between the pits and lands within the spiral data pattern is also significantly less than on a CD-R disc. What Makes River Media DVDRs the professionals best kept secret? 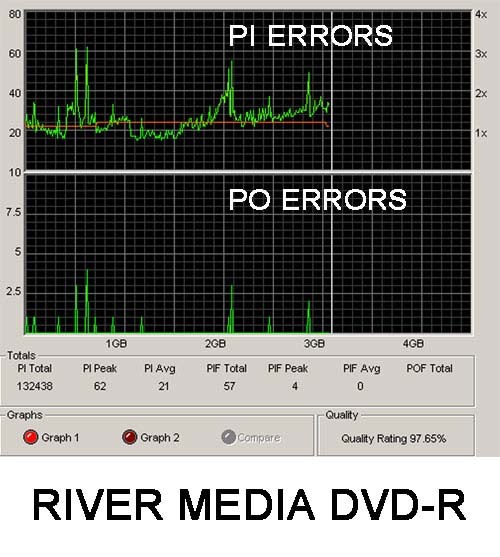 Error correction in DVD media is measured with PI and PO (parity inner and parity outer). Where as in CD error correction C1 errors that are not corrected become C2 errors, in DVD a uncorrected PI error becomes the more severe PO error. 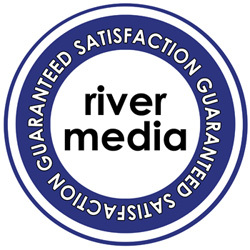 River Media DVDs are the culmination of many years of manufacturing and technical excellence. As a result the performance is second to none. 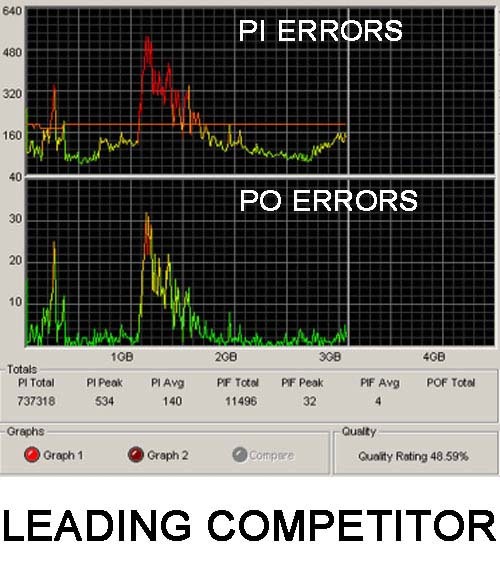 Below are results from PI/PO scans of our DVD-R compared to a leading competitor. Brilliant White - No off-white or cream finish, when we say white we mean it! We're so confident in the quality of our media that should you not be entirely satisfied we'll offer a full refund - no quibble. Select the needed Check box and click buy of RIVER DVD-R 4.7GB 16x Silver Inkjet FS.